There is an increasing interest in listening to young children and involving them in decision-making, which can be said to have come about partly because of the United Nations Convention on the Rights of the Child (UNCRC) ratified by the UK in 1991. Children's active involvement in changing their environment has also been promoted by a number of projects exemplified by the United Nations Economic, Scientific and Cultural Organisation (UNESCO) Growing Up in Cities project (Chawla 2002), which grew out of the participatory planning movement led by Kevin Lynch in the 1970's offering one of the first cross-cultural exploration's of young people's perspectives on the environment. 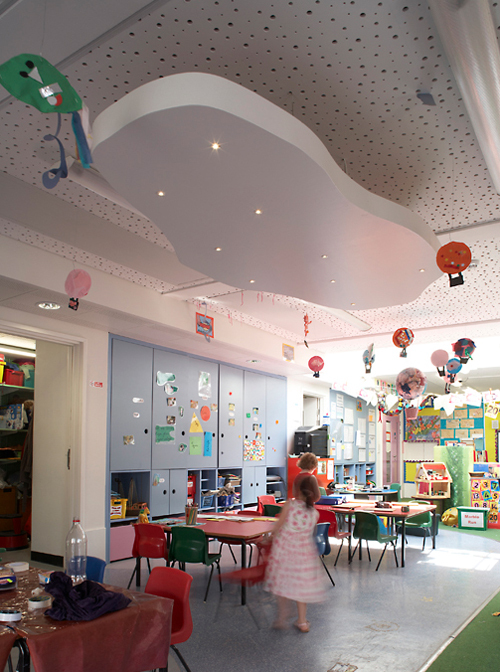 Whilst some architects (Dudek 2001, Day 2005) have sought to analyse architectural environments that are successful for early childhood learning environments, with key aspects directing attention to variety, visibility, accessibility and flexibility, young children's perspectives have been under resourced. The Living Spaces Study was a 3-year study from 2004-2007 developing earlier studies by Alison Clark and Peter Moss using The Mosaic Approach. 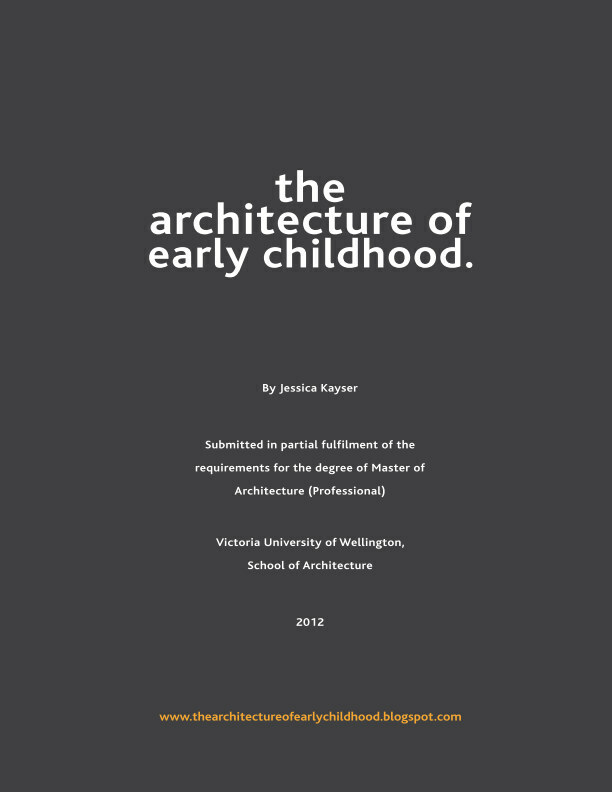 The aim of the study was to investigate how young children's views and experiences could inform the planning, design and development of early childhood centres. - magic carpet: a pretend journey, children were asked to compare their preschool with another through photos on a computer. Also important to consider was that the facilities are shared by the adults as well as the children. Therefore findings from the children's studies were shown and discussed with the practitioners (e.g. teachers) and the parents, enabling them to understand how the children viewed the space and allowing them to comment on and discuss their own views of how the space was currently functioning and how it could be improved. The project architect Jennifer Singer was involved with the project at numerous stages, and sat in as an observer during some of the activities. A seminar was arranged with Jennifer and her colleagues at Greenhill Jenner Architects to discuss the studies results. - places to sit and wait with parents and siblings. One child explained how she liked to sit by a particular window because she liked to see her family bringing her younger sister to the early learning centre. Therefore, bay windows were utilised enabling this activity. 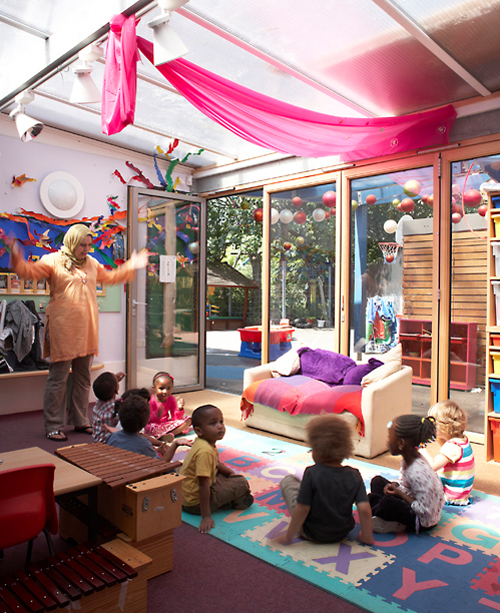 A semi-transparent roof in the shared space and large bi-folding doors connects with the outdoors, allowing the children to enjoy the outdoors as much as possible. The children demonstrated the importance of feeling connected with other parts of the school including the outdoors, thus transparency was an important design consideration. 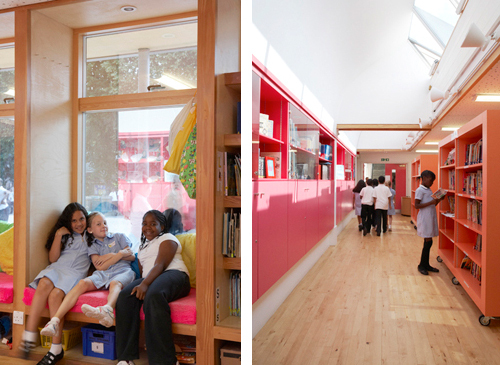 All of the joinery was designed with the scale of the young child in mind, with the lower shelves and cupboards accessible to the children, with the upper storage cupboards accessible only to the teachers. 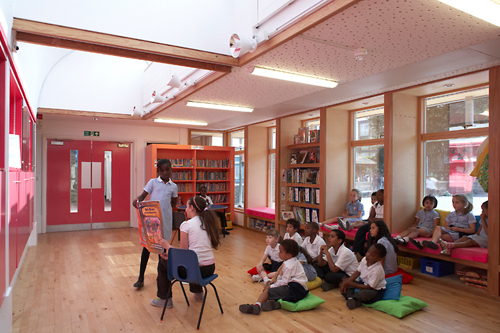 The study revealed the children's interest in the sky, the ceiling and ground planes. In response to this the architects designed 'island-like' floor patterns, and a unique ceiling with a 'swiss cheese' pattern and floating 'clouds' designed to mimic the sky. The architects also worked closely with the engineers to create a special lighting scheme that enhanced the ceiling design. Photos taken from Jennifer Singer's website. The study has shown how listening and collaborating with all of the buildings users can result in a greater understanding of the multiple meanings embedded in architectural space. The study shows also how understanding children's views on their environments can be used to create better learning environments that are far more in tune with children's needs. For more information see Alison Clark's book: 'Transforming Children's Spaces: Children's and adults' participation in designing learning environments' or from the Bernard van Leer Foundation report 'Early Childhood Spaces: Involving young children and practitioners in the design process'. I thought it was a very good idea, to actually encourage them - children, to be actively involved in the decision making of any kind. This time, it is there school, which makes it even better, as it will allow them to settle in more and enjoy the environment and to be more focused on their studies and general well-being. Excellent! very impressive.